The Great Kindness Challenge was held at Abrams the week of January 22 led by Ms. Shanks, our counselor extraordinaire. Everyone linked HANDS TOGETHER and shared WAYS THAT WE CAN BE KIND! 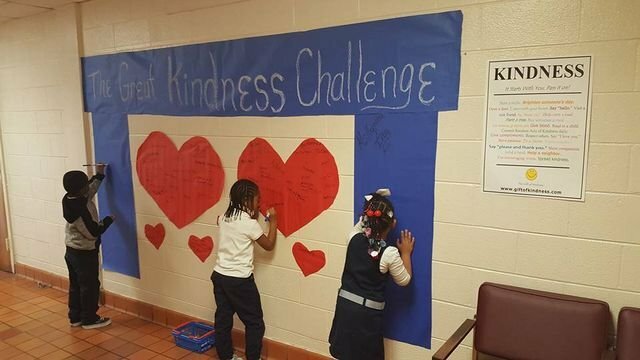 Students, faculty, and staff signed a display in the hall saying they agreed to participate in the the Great Kindness Challenge. It's amazing how kindness radiated in the halls and classrooms as we all practiced being kind with smiles, compliments, and kind deeds. The Great Kindness Challenge may be just a week long event, but all agreed that Abrams wants to practice this challenge daily.